Accueil » Articles	» The future of solar energy : eruption or « pause »? The future of solar energy : eruption or « pause »? Photovoltaic solar energy seems to have taken off in the world since 2012 and is considered as a future-oriented sector, particularly in the United States and China. The total capacity of solar electricity production has been multiplied 57 times between 2000 and 2015! It has increased from 4 to 227 GW of installed capacity (see N.M. Haegel et al., « Terawatt-scale photovoltaics: trajectories and challenges », Science, 14 April 2017 issue 6334, p.141, www.sciencemag.org ). The photovoltaic « barometer » (EurobservER Photovoltaic barometer, April 2017, www.eurobserv-er.org/photovoltaic-barometer-2016 ) reports a spectacular growth in power installed worldwide and connected to an electricity grid in 2016 : 76 GW of electric power which is 50% more than in 2015. China is far ahead of this solar performance since it connected 35 GW solar to its network last year (instead of 13-15 GW in 2015), the USA being second only to double its connected power (15 GW connected in 2016 against 7.5 GW in 2015), India, in third place, is continuing to accelerate its solar growth (7 GW between March 2016 and March 2017), with a total installed capacity of 12.3 GW. Paradoxically, the EU, which is often at the forefront of the debate on combating global warming and promoting renewable energies, was back in 2016 on its internal market, national situations being strongly contrasted: Germany is stable (1.5 GW of new power between 2015 and 2016), France is rather backward (560 MW connected in 2016 instead of 900 MW in 2015) as the United Kingdom (2.4 GW compared with 3.8 GW in 2015). Germany has a clear dominance of the solar panorama in Europe: a total installed capacity of 41 GW in 2016, ahead of Italy (19 GW), the United Kingdom (11.5 GW) and France (7.2 GW) (cf. map of average sunshine in Europe) . After the global 2016 boom, some experts expect a market break in 2017, as several countries, notably the US and Europe, have decided to limit tax incentives (a tax credit) and lower purchase tariff for renewable energies kWh, but a scenario with 500 GW of total installed capacity over the period 2016-2022 seems credible to experts. It will be noted that the profitability (excluding subsidies) of the photovoltaic sector has not yet been reached, except in exceptional cases (probably California): according to the IEA (estimates of 2014, world average annual) the cost of the MWh produced would be 160 € for large power plants and 180 € for domestic installations (solar panels on roofs or terraces), but they are expected to fall sharply by 2030 to around 90 € / MWh for power plants (close to the price of production by power stations « Classics ») and 115 € / MWh for domestic installations. It is useful to give a spotlight on the French situation. In 2016, according to the scoreboard of French electricity production (Ministry of the Environment, Energy and the Sea, Key figures for energy 2016, February 2017, www.statistiques.developpement-durable.gouv.fr ), electricity production by the solar sector accounted for 8.8 TWh (up 14% compared to 2015) or 1.6%of the global national electricity production. 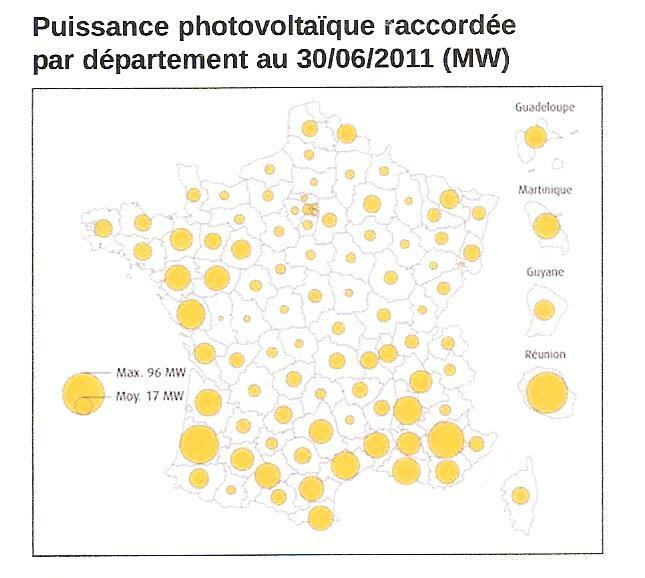 It is operated by 382,000 installations (most of which are low-power with domestic panels), and is concentrated in the south / south-west area of France (see the key figures chart). It should be noted that the availability of this sector is only 12.4% (the ratio of the total energy produced over a year to that with the installed electric peak power, ie 7.1 GW); it is five to six times lower than that of conventional sectors (hydraulic, thermal and nuclear). The relatively low availability of the photovoltaic solar sector, in the case of France it is true, points to a key point of production by all renewable sectors (with the exception of hydraulics): their intermittency. 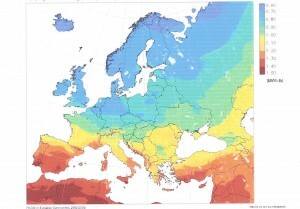 This depends, of course, on geography, availability being higher for solar energy in countries with high levels of sunshine (Italy, southern Spain and California, for example). The availability of wind energy is much higher in France (about 23% for land-based wind and more for off-shore because there is always wind on the coast). This disparity explains, in particular, the fact that in most energy scenarios, by 2040-2050, notably those of the International Energy Agency (IEA), the wind energy sector is in first place in the production of Renewable electricity. Let us add, to be complete, that the photovoltaic sector is not the only solar sector. Indeed, one can produce electricity by « concentration »: solar radiation is concentrated by mirrors either at the top of a tower or on tubes where circulates a liquid absorbing solar heat. By means of a set of heat exchangers, a liquid (water, for example) is vaporized which supplies a turbine coupled to an alternator. This sector is interesting for countries with high levels of sunshine, Morocco being a leading country in Africa in this field with its Ouarzazate power plant (see Louis Boisgibault, “Le Maroc, locomotive africaine de la transition énergétique” , Le Monde de l’Energie , www.lemondedelenergie.com ). The increase in global electricity production by the photovoltaic sector is undeniably encouraging, but if a « pause » is to be avoided, especially if public subsidies are reduced or even eliminated, can technical progress be expected which would bring a new breath to the industry? The US experts we quoted are relatively more optimistic than the IEA in their forecasts (N.M. Haegel and al. Science, they belong to the Global Alliance of Solar Energy Research Institutes). The improvement of solar cells efficiency (on average 20% for silicon cells which peaks at 25% if they are equipped with optical concentration devices), would, according to them, achieve a production cost objective of 0.3 $ / kWh in the USA, a figure which seems unrealistic in the medium term. In any case, it is necessary to blow up two technical locks: the storage of solar electricity and the improvement of the cell efficiency. The first concerns all intermittent power sources, it is necessary to find suitable low cost techniques, the improvement of electrochemical batteries being probably an unavoidable objective (finding an alternative to lithium-ion batteries being a solution). We will not discuss it here. As far as solar cells are concerned, there are already alternatives to silicon : cadmium telluride (a toxic metal unfortunately) and selenides of copper, indium and gallium being alternatives, the yield of which is 22.3% (P.Papon, 2050: Quelles energies pour nos enfants? 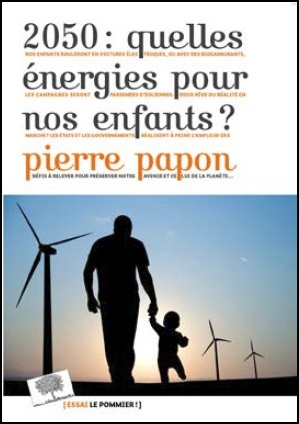 Paris, Le Pommier 2017, www.editions-lepommier.fr/quelles-energies-pour-nos-enfants ). By superimposing several semiconductors, cells with a high efficiency (close to 40%) can be made but their cost is also higher. The researchers have been on a different path, for nearly ten years, that of a new class of materials: the perovskites. These materials are not new but Japanese researchers have synthesized organic and inorganic « mixed » semiconductor compounds (including methyl ammonium and lead iodides) belonging to this family, solar cells built with some of these materials have a yield close to 22%. These cells have a double advantage (although they use lead which is toxic …): their yield is equivalent to those of silicon cells while their chemical synthesis takes place at a moderate temperature (less than 100 ° C.), which would reduce their production cost. However, they could be used only once their chemical stability will be ascertained; their use in crystalline thin layers with other semiconductors such as gallium nitride stabilizes them (see O.Egen et al., « Graded bandgap perovskites cells », Nature Materials, Vol.16, May 2017, pp. 522, www.nature.com/naturematerials and Yang Ynag and Jingbi You, « Make perovskite solar stable », Nature, Vol 544, p155, 13 April 2017, www.nature.com ). Other routes are explored, those of plastic semiconductor materials, doped with dyes in particular, they are cheap but their efficiency rarely exceeds 10%. We must not exclude « ruptures » phenomena that would make it possible to use in a material all the photons of the sunlight in order to extract electrons (the silicon absorbs only a part of solar energy, especially in the red and the infrared part of the spectrum). Perhaps this could be achieved by triggering excitation cascades in semiconductor polymers, doped with inorganic nanoparticles, with solar photons which, by producing other photons, would dislodge several electrons from the material, the yield could be close of 100% ….. The path of solar energy will only be fully realized at the cost of a great research effort to find an alternative to silicon in the medium term, thereby improving the efficiency of the cells while reducing their production cost. Furthermore, it is necessary to blow up the electricity storage technical lock. It is clear that these issues were hardly mentioned in energy transition debates in France, especially during the presidential elections. 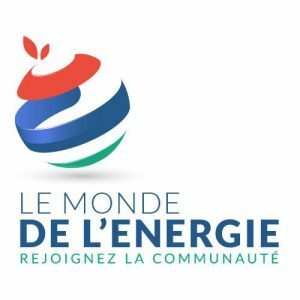 Finally, it should be noted that the multiannual energy programming which was adopted at the end of 2016, in France, for the period 2017-2023 (provided for by the Energy Transition Act of 2015) set the target of an installed solar power of 20.2 GW at the end of 2023 (7 GW at the end of 2016), ie an annual rate of 2GW that has never been reached in France (but equivalent to that of Germany). It will therefore require a considerable acceleration of investments in the sector, accompanied by an industrial policy and a research effort. It will be up to the new government to give itself the means of this energy policy.